Last night, in the below freezing temperatures of evening, stood a mass line of anxious musical supporters awaiting to see a FREE (yes free) concert. The line extended from the doors of the Lincoln Theater, down pass the D.C. staple, Ben’s Chilli Bowl (and it’s extended branch, Ben’s Next Door), and wrapped around the block of 12th & U St. Whom was the guest for the evening? 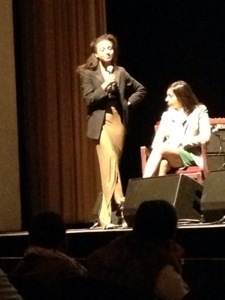 Only the cool, calm and collected Grammy winning artist herself, Esperanza Spaulding! The atmosphere was filled with good vibes and positive people, no matter how freezing it was outside (and inside) of the theater. As Esperanza graced the stage with her presence, her witty, yet down-to-earth, personality shined through her during and between her songs. In fact, as her hair style for the night was unusual for her brand as she rocked a sophisticated straight and pulled back look, she actually told the audience (in a joking manner of course) that her “Afro comes out for PAYING guests”! Not one to have a big band with her, she started her set with her and her acoustic bass, and a drummer with only a snare. Simplistic, yet powerful! For the next song, the drummer moved to the kit, and also entered a keyboardist. 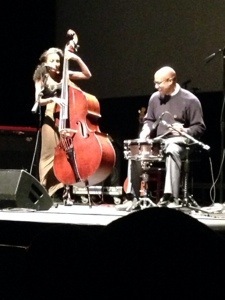 All was well and soothing as the crowd was enjoying their “Evening with Esperanza Spaulding”, as the event was named. Esperanza conversed with her audience through her songs, and after a few, there came a little more to this event than just Esperanza. The conversation shifted to the real reason that everyone attended is “FREE” concert; it’s not like this wasn’t expected (although there were probably some that did happen to miss the “Spotlight on Guantanamo” in slightly finer print above “An Evening with Esperanza Spaulding” on their ticket(s). As the musicians depart the stage, onto the stage enters a man to introduce Van Jones, political commentator and host of CNN’s “Crossfire”, to facilitate a panel discussion, with a few other guests, on Guantanamo Bay. Just in case you haven’t heard, Congress has recently eased restrictions on transferring prisoners out of the camp. Esperanza, herself, expressed her passion for wanting the US to completely shut down the infamous camp grounds, and that is why she agreed to host last night’s event. After getting a bit serious with the panel discussion, it was finally time for more music. 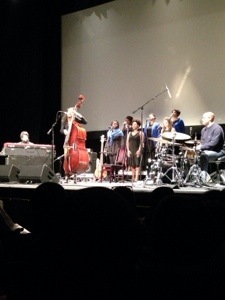 This time, Esperanza was joined on stage by Howard University’s own featured jazz ensemble (and also fan favorites during season 2 of NBC’s favorite musical geek show, The Sing-Off), Afro Blue. As they sing a few songs, with Esperanza switching it up from acoustic to the bass guitar, they topped off the night with her single, “Black Gold” (which she sings with Algebra Blessett on the track). All was well by the end of the night, which was finally capped with a video that she made called “We Are America”, which protests and calls for the extinction of the Guantanamo Bay camp. The video also features A-list celebrities, such as Harry Belafonte, Stevie Wonder and Janelle Monae. If you would like to learn more about Esperanza’s movement, visit this link and watch the video: http://vimeo.com/m/79294714. All-in-all, it was a great night of great music, with a side of politics. After all, it is still DC! When I Googled “Neo-Retro-Soul”, and searched through several pages, I did not find an exact definition. However, I did find (aside from a band called Neo-Retro) links to music/songs that seemed to fit my perception of this genre. Therefore, here is the definition that I have come up with: Neo-Retro-Soul – songs created in the 21st century that are inspired by, and reflecting elements of, old-school soul (namely 1950s-1980s). So, with the sound reflecting nothing younger than 25 years old, why has the sound emerged so frequently since the 21st century? Hopefully this exploration of the genre, the artists and the society that surrounds it will provide a clearer explanation of its current effects, and how it could continue to influence the generations to come. There are artists that have garnered their success from branding the majority of their musical sounds to the Neo-Retro-Soul genre. Such artists include Rapahel Saadiq (post-20th century), the late Amy Winehouse, and Sharon Jones and the Dap Kings. When listening to albums such as “The Way I See It”, “Back to Black”, and “Give the People What They Want”, there’s an overall experience that just seems familiar. There are other voices that seem to have just transported directly from the Retro era, such as Joss Stone, John Legend, Adele, Aloe Blacc, Leela James, Anthony Hamilton, Chrisette Michele, and (again) the late Amy Winehouse. As I channel my inner Ben Folds on “The Sing-Off”, the timbre of their vocal instruments radiate the essence of Neo-Retro-Soul, whether their musical accompaniment fits the mold of the genre or just modern-day influences. Now, that’s not to say that only unique, husky or jazzy vocals are the only sounds that relate to the Retro-era. The light and smooth sounds of Marvin Gaye, Diana Ross, Stevie Wonder, Roberta Flack, Wallace & Walter Scott (from the Whispers), Dionne Warwick, and countless other artists, reminds us of good times and are some of the most influential artists of the era. My personal favorite is Philip Bailey of those good ole elements, Earth, Wind & Fire. Very light and smooth, but once he reaches up high for those extra octaves, everyone better watch out! In this day beyond the Retro-era, I feel as though no male vocalist has come close to his range. Eric Benet does try…maybe El DeBarge is closer (but that would have to be 80s/early 90s El). Nope, no one comes to mind (and feel free to correct me if I’m missing someone). With this said, the light and smooth vocals of today have to do more to stand out in the Neo-Retro-Soul genre. They could not be classified or branded as such alone, but also must rely on the Retro-era groove of their music to be recognized as such, and make the impact that cuts through their often Neo-Soul or contemporary R&B persona. Have you ever heard a song with a feel that just made you want to do nothing but bust out into an old-school dance move, and not the late-80s/early-90s moves that you may bust out at a party?! (Btw, I know it’s not just me!) This is what solidifies the Neo-Retro-Soul sound for me. I mean, at 30 years old, there should be no good reason to bust out into a pop-lock or the jerk when I hear a song. Oh well, blame it on the old-school grooves! Raphael Saadiq’s “Love That Girl” is a prime example. This song has the groove of 50s/60s hand-dancing written all over it. My parents couldn’t get enough of it! Bruno Mars’ song “If I Knew”, from his latest album, feels very Sam & Dave. Just listening to it makes you want to 2-step, snap and slide to the mic. “I Decided, Pt. 1” by Solange is your girl group flashback. I feel the Supremes all over the claps on all 4 beats when I hear this song (reference the song “Where Did Our Love Go”). Point being, the vocal leads of these 3 particular songs may not embody the rough sounds of a Retro-era Soul singer, but the grooves of the musical compositions were enough to solidify the overall sound of the songs as Neo-Retro-Soul worthy. One person that’s had great success in this genre within 2013 has been Pharrell Williams, producer, rapper, singer extraordinaire! He was all over the map last year with productions that included: the top song of the summer (and some might say of the year), “Blurred Lines” with Robin Thicke & TI; producing the Despicable Me 2 soundtrack (and the first also) which spawned the commercially successful hit “Happy”; and collaborating with dance music legends Daft Punk on their fresh off of the press Grammy winning album “Random Access Memories”, which also included the very groovable hit and Grammy winning single, “Get Lucky”. Not exactly sure what enhanced his love for the Neo-Retro-Soul sound at this point, but a lot of us are surely having a good time while he’s on this train! Btw, I’ve always been a fan of his, the Neptunes & N.E.R.D., so although this is his current sound for the moment, I’m always excited to see what more he has in store going forward. This is just my overall, satellite point of view. The Neo-Retro-Soul genre, and the artists that embrace this sound, is influenced by multiple things, and includes multiple layers. Next, let’s dig a little deeper to see what some of those influences are and if they will continue to influence more generations to come. Hello family and welcome to TAGDMV! Back in 2010, it was placed on my heart to create a place in which people can explore, experience, and share in the artistry of the extraordinary talents that have originated in the DMV area. For those that are unfamiliar with the acronym, DMV stands for District of Columbia, Maryland and Virginia. This area, in which I was born, raised and still currently reside, is not a mega-site for exploring talents nationally. However, there have been key artistic figures to originate from the DMV area, including Duke Ellington, Marvin Gaye, Martin Lawrence, Dave Chappelle, Dave Grohl (from Nirvana & Foo Fighters), Good Charlotte, The Braxtons (including Toni Braxton), Laz Alonzo, and, of course, Wale. Although a good number of the artists mentioned above are musicians, the DMV area has a crop of great artists of all genres. The goal of TAGDMV is to tag into all of these genres, including music (singers, rappers, bands, musicians, DJs, etc. ), acting, poetry/writing, visual arts, dancing, fashion (designers/models), etc. We aim to shine a spotlight on those who are blessed enough to be engaging in their crafts/gifts, and also hope that they will continue to bless others (whether they be fellow artists or fellow supporters from their community) along their journey as well. This is just the first step in “officially” launching our brand’s venue. Right now, you can look forward to blogs on subject matters of each of these genres, and there will be interviews of local artists whom have found success within the DMV area, and outside of it. With that in mind, our brand is only as successful as our team…and that team is YOU! As we go along on this journey together, I would appreciate any and all feedback from you to help make our mission beneficial for our community as well. So, let’s get started and inspire a generation of artists that will influence the DMV community, and beyond!